The Panasonic Eluga I4 comes one year after the Eluga I3 and sports a MediaTek MT6737 processor, runs Android Nougat out of the box, and provides 4G VoLTE support. Its price tag reads around US$126. Although Panasonic smartphones are not present in most Western markets, they seem to be quite popular in India. The iconic Japanese brand has recently introduced the Eluga A3 and the Eluga A3 Pro in India and now, about one year since the release of the Eluga I3, the Panasonic Eluga I4 joins this family of affordable Android handsets. 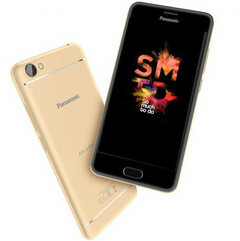 The Panasonic Eluga I4 has a metallic body and uses a low-resolution 5-inch touchscreen with 2.5D curved tempered glass protection. This handset has a quad-core MediaTek MT6737 processor under the hood, and it also comes with 2 GB RAM, 16 GB internal storage, and microSD support up to 128 GB. The cameras only provide 5 MP (front) and 8 MP (main camera, with quad-LED flash), so mobile photography fans should skip this handset. A fingerprint reader is also present, accompanied by the usual connectivity features for this area of the market - USB OTG, WiFi 802.11 b/g/n, Bluetooth 4.0, GPS, as well as 4G VoLTE. Considering the specs above, the 3,000 mAh battery of the Eluga I4 should deliver a good autonomy. In addition to the above, the Android 7.0 Nougat-driven Panasonic Eluga I4 also has dual-SIM capabilities and integrates an AI assistant named ARBO. Sadly, there are no details about this apparently interesting feature, but we can only hope that Panasonic made it capable enough to help the Eluga I4 fight its competitors. The Indian entry-range mobile market is very crowded, and Panasonic's new Eluga phone has to face popular handsets such as Xiaomi's Redmi 4, the Moto C Plus, the Nokia 3, or the Lenovo K6 Power. Those interested in acquiring the Panasonic Eluga I4 can find it in Panasonic's shops and authorized retail outlets across India. The color options available are black, gold, and blue. There is a single Eluga I4 variant available for now, and it can be purchased for a price of INR₹8,290 (about US$126.5).